Wooden Frame: This is a 17 digit professional soroban abacus with a beautiful wooden frame. 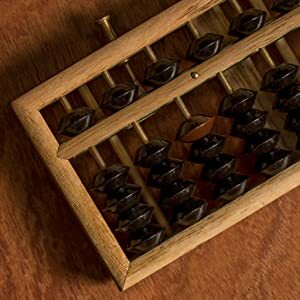 The design alone makes this abacus worthy of being a decorative piece as well as a counting tool for trade and education. Reset Button: This soroban comes with a reset button for quick and easy reset. Rubber Feet: Non marring anti-skid rubber feet on the base of the abacus keeps this soroban from sliding around while in use. My mother made me go to Abacus school when I was younger. Even as a child, I was fascinated and impressed by my school mates who were able to perform very complex calculations all in their head. Unfortunately, I never reached their level during my brief schooling before having to move, but I suddenly decided that I wanted to pick back up where I left off after over 30 years of hiatus. This abacus made of wood is surprisingly large. Because it is so much bigger (3 1/2″) and heavier than more standard abacus I was used to, I was initially turned off by it. However, I decided to try it out and then I started appreciating it more by day. Because it’s heavy, I don’t ever have to steady it with my other hand and the Reset mechanism that I initially thought was unnecessary came in very handy because of the heftiness of the device.The beads move well and stick where you place them fairly ok. The beads are a bit looser than the abacus I had as a youngster, but for all intents and purposes, this is a good device at a reasonable price and probably would work out better for men with larger hands. Although the corner brass bracings could be done better (mine are lifted and wrinkled), It has an interesting antique look to it. For those of you looking to learn Abacus, there’s no need to purchase expensive educational books. You can find many great free resources on the web –for one just search for “ABACUS: MYSTERY OF THE BEAD” and you’ll learn all necessary concepts, and the rest is for you to practice practice practice. I add 1 through 100 daily (sum 5050), and subtract back down to 0 multiple times. There are more exercises you can perform like games in the aforementioned tutorial and other online resources. Like everything else, the more you practice your speed and coordination improves and you’ll be able to visualize calculation in your mind without having to use the device. It’s a fair looking soroban. Feels sturdy. The Craftmanship leaves a tiny bit to be desired, as there is glue smeared very obviously on it.The feet on the bottom are nice but there’s only one on one side and 2 on the other which makes it a slight bit wobbly.Reset is good and appears to work well.Beads are nice and I’m guessing resin as others have indicated, as it has a faint odor (like my grandpa who was a diesel mechanic always had on his clothes). I’m hoping it eventually goes away, but it’s not too over powering. It was in my hot mail box for a while which potentially made it worse.All around it’s a good little tool and though im just learning to use it, I’m excited about having it. Would probably buy again if i had a need to. Good for the money, quality is so-so. This is a decent soroban for the price. It is a good deal larger than a standard Japanese soroban, and thus may be better for large-handed folks or those simply not used to fiddling with little beads. The finish a little rough: you can tell this thing was meant to reach a price point. Inner wood surfaces are not varnished/treated the same, and the fittings are cheap sheet metal. That said, the beads are smooth, consistent enough, and the clearing mechanism works well enough. The beads aren’t exactly all the same size, so the clearing bar can’t quite push every bead clear perfectly, but it’s enough for practical use. I also had to tighten down a couple screws on the clearing mechanism by hand: they simply weren’t driven in all the way out of the box.Finish and detail aside, this soroban is very sturdy, and seems like it could take a good deal of punishment. I could see this being the soroban at a cash register in a market.I wish the brown beads that mark unit columns was a little lighter: in some lighting it’s hard to differentiate it from the black ones.If you’re just getting into learning a soroban, this would be a fine choice. The beads are heavy and satisfying, and the rubber feet and sheer weight mean it stays put on a table. Someone unfamiliar with using a soroban may find the standard-sized ones too small.I would NOT get this soroban if you’re looking for an “authentic” Japanese soroban. The smaller, black-framed, brown-bead soroban is the “standard” size and design. This is more like a Chinese abacus made in the style of soroban. If you’re going to transport your abacus (say, to school), you may also want to look for a smaller, lighter one. This is a nice Abacus board. It’s well built, the beads are a nice size, spread just far enough to see easily yet move quickly. I like the 2 decimal placement on the right side. The color bead placement makes good sense to me and adds visual clarity. The clearing mechanism works great and seems sturdy. 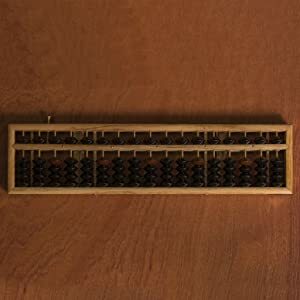 I had a plastic Abacus, and researched a lot of boards to find a better one, I’m glad I found this one. If you are blind or visually impaired don’t buy it. The beads are absolutely unstable. I have a really gentle touch and even steal the beads didn’t stay in place. I ended up having to buy another one. Was just a waste of money and time in my keys. Great Soroban Device from Yellow Mountain Imports! Great soroban device for the price! Outstanding quality and value, this product is true to the picture. The soroban is well made (sturdy) with metal brackets reinforcing the corners. The finish is excellent, and all beads slide smoothly and stay in place during calculations. The rubber pads on the bottom of the wooden frame provide a very stable, level platform and keep the soroban from sliding during use. The “reset” button is a great feature to ready the device for the next calculation. This “reset” is not present on a lot of devices on the market and was a definite plus in my buying decision. This feature saves a lot of time and effort in zeroing the device during use. Although a little difficult to see from the picture, the frame mounting hardware and light-brown beads (among the dark-brown ones) help keep track of the “1” position during calculations; another definite plus that adds to the aesthetics of the device. I would definitely buy this product again from Yellow Mountain Imports.